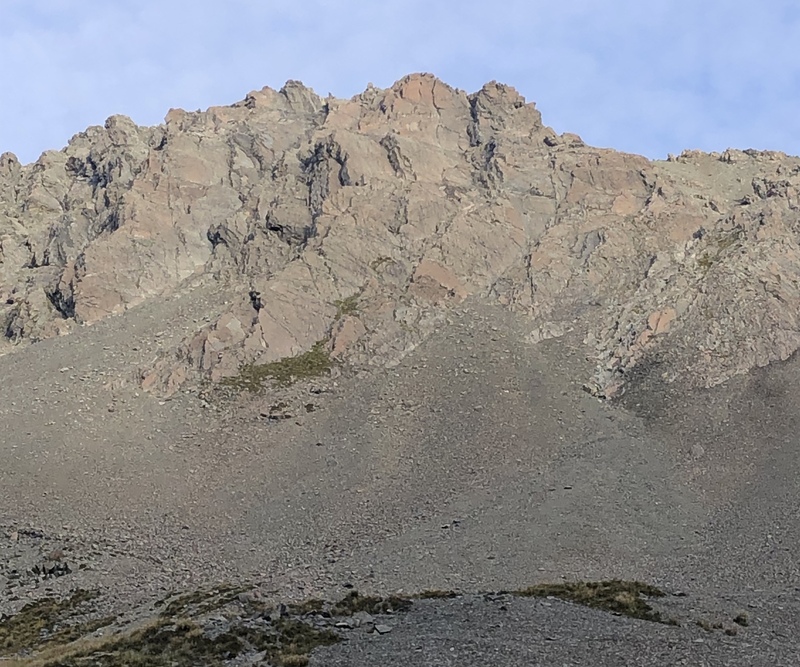 Begin at the pronounced rock butress at NZMS498687 and follow the ridge to the reach a point just to the east of Pk1975. A rope may be needed in places on the lower section. It is easy to traverse off the ridge once above the lower butress. Seven pitches on salmon hued greywacke on the northeast side of the face. Begin at crack twenty metres from the lowest point of the slab and climb diagonally towards the crest of the slab. Follow a line parallel to the edge of slab towards the summit. Pleasant climbing with short section of grade 14 in middle of the route. Finish by climbing the Friend crack up the pink slab to the left of the vertical rock. Eight pitches with the first and final pitches providing excellent climbing. 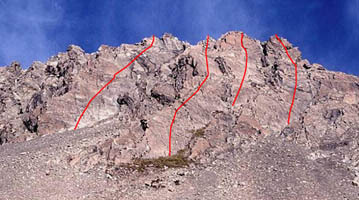 Begin by climbing the obvious left tending crack for 15 metres, then straight up the fine fall line crack system at grade 15. Continue on up steady grade 12 climbing until the final pitch which includes a section of perfect finger crack, grade 15. Finishes by surmounting the preposterous summit block. 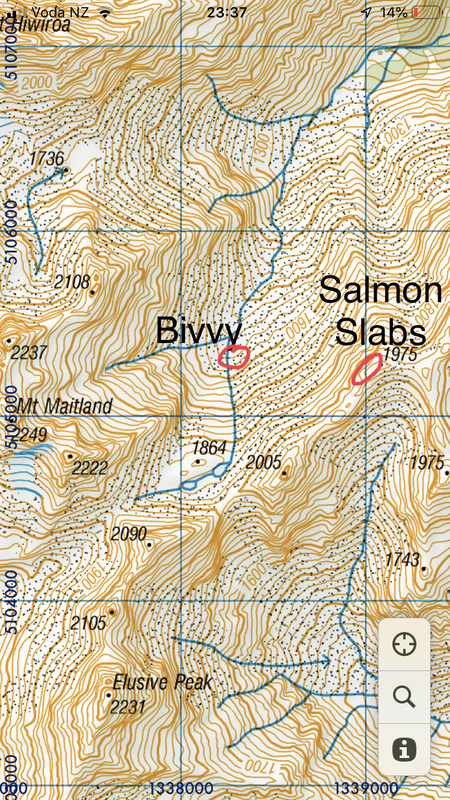 Begin at top of the scree just right of darker coloured rock near the centre of the Salmon Slabs and follow the line providing the best climbing, aiming for the high point on the slab. Finish by climbing the lefthand of the two prominent features on the upper part of the slab. Mostly grade 12-13 climbing but grade 17 technical moves on the well-protected final pitch. A three pitch route which begins high in the shallow gully on the lower margin of the slabs. Start by climbing the groove on the righthand slab directly toward the summit. Finish by climbing the crack on the left side of the slab. Steady grade 13 climbing. Location of this crag was hard to come by. We accessed recently for a great climb. There is a reasonably well trodden and marked track up the true right of the southern most branch of the south temple stream. 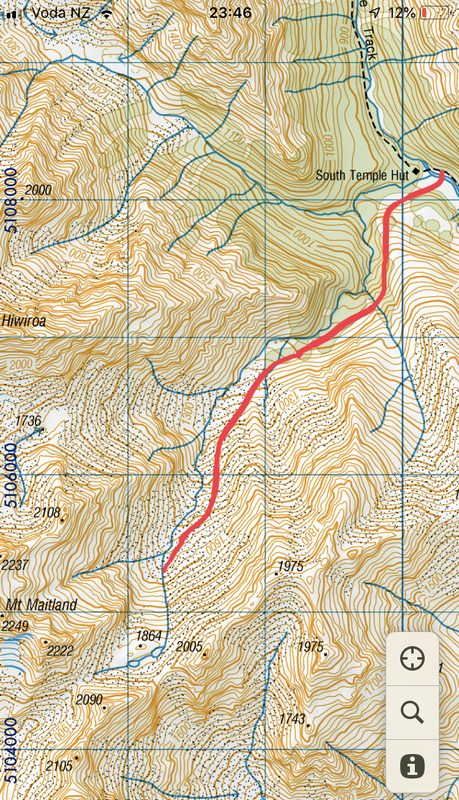 In the upper reaches there is also tape marking the route. The crag is located on the northern most pk1975 (there are 2). The slabs are on the NW aspect.